Nikon UK has just announced the AA battery powered, 14-megapixel Nikon Coolpix L310 with 21x optical zoom. 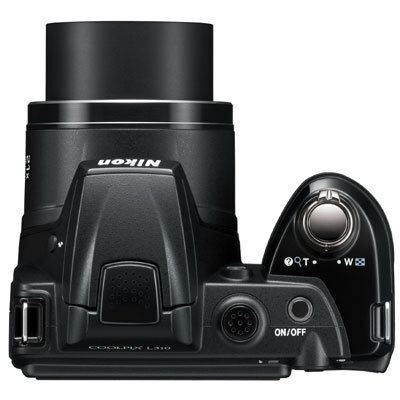 Apart from its remarkable 25-525mm equivalent zoom lens, the Nikon L310 also offers a high-resolution 3” display, and 720p HD movie recording with optical zoom and auto focus. In addition, the camera features 17 scene modes and Nikon’s Smart Portrait System with Smile Timer, Blink Proof and Red Eye Fix and Skin Softening technologies. 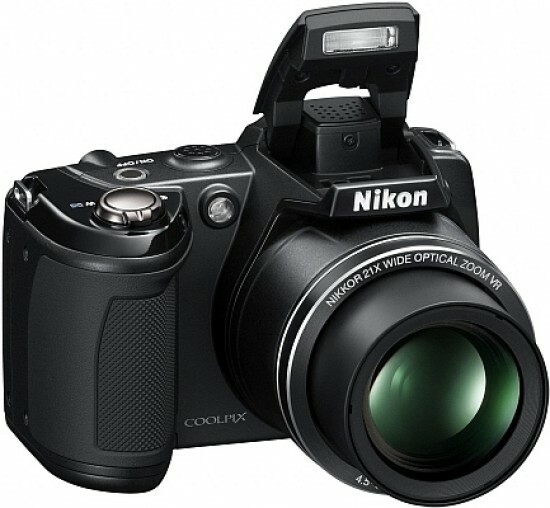 The Coolpix L310 will hit the shelves on 15th March at a recommended retail price of £199.99 / €236.00. London, UK, 1 Feb 2011 – Nikon today announces the COOLPIX L310, a high zoom camera that combines superior image quality with the flexibility of a long zoom, making it ideal for all types of photography. The camera’s 14-megapixel sensor and 21x wide-angle optical zoom lens work together to produce stunning results, whether you are shooting stills or HD movies. An excellent performer with impressive range, the COOLPIX L310 is an easy to use compact camera that benefits from an impressive 21x optical zoom, high resolution 3 inch LCD and HD (720p) movie recording. From extraordinary panoramas to close up action, you can capture it all with the powerful NIKKOR 21x optical zoom lens (25-525mm). The L310 offers the exceptional image quality Nikon is known for, maximising the 14 megapixel CCD sensor, high ISO capability (6400) for low light shooting and four anti-blur technologies for super sharp images. Creative photographers will enjoy the ability to record HD (720p) movies, accessible via the dedicated movie-record button that allows you to switch between shooting stills and images with ease. Optical zoom with autofocus function is available during recording, and photos and movies can be conveniently taken and viewed on the large 7.5 cm (3 inch) high-resolution LCD monitor. The COOLPIX L310 has been built with convenience and comfort in mind; having a dedicated button for movies and with the auto control function buttons being positioned for easy access. Novice photographers will benefit from camera’s auto controls, including the 17 scene modes which can be selected to fix the settings for popular photographic styles, effects and locations to ensure you capture the best image. For added ease, the Scene Auto Selector mode allows the camera to select the optimum Scene mode for the situation you’re shooting in, so all you need to do is point and shoot! Stunning portraits are possible using the Smart portrait system which features Smile Timer, Blink Proof and Red Eye Fix and Skin Softening for flawless subjects every time. For added convenience the COOLPIX L310 is powered by four AA-size batteries. 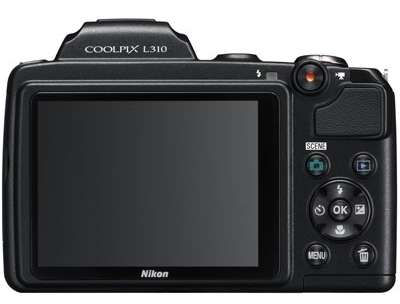 The COOLPIX L310 is available in black.